Contemporary Farm Painting "On a Peaceful Summers Day"
These two night sky paintings are the second and third in my "Under the Big Dipper" night sky series that I started later last year. The first three of these paintings have already been sold into private collections and the fourth one is currently available for sale. I love how out in the flat Midwestern country side, one can see for miles around and the big open night time sky, full of stars at night. I have painted these pieces with an iconic old red barn farmhouses, for the simple scenes that I enjoy painting so. This is a farm portrait that I was commissioned to paint recently of an old farmstead in Iowa. This lovely old farm had a big white traditional farmhouse and an iconic old red barn. My client wanted a simple scene with one large central tree for the painting. The inspiration for this piece comes from the big, wide open sky that I love so about the country. 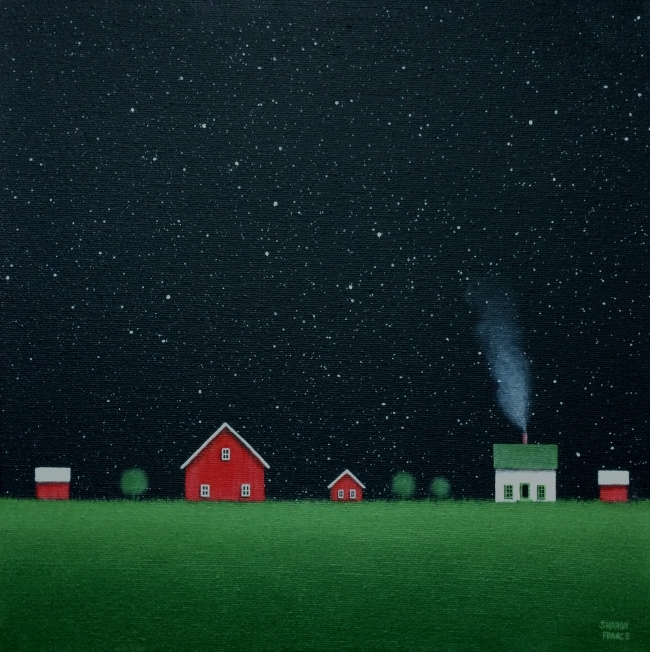 I decided on painting the big dipper above this simple farm scene under a sky full of tiny stars. Farm portrait in progress right now. I have been too busy to post here for while now. Right now I am working on a commissioned painting of a custom farm portrait for a client. This will be a present for their husband so is under wraps for now! I will plan to post it here on my blog in the future, with my clients ok after it has been delivered. Here is an example of a previous farm portrait that I painted in the past. This portrait was painted for a couple in Sweden of their farm and three pet cats in the scene also. A fun painting to work on! My most recent farm painting. I started this painting back in the winter but then set it aside as I was not sure what direction I wanted to go with it. I looked at it one day in July and realized then what I wanted for it! I sometimes do this with a painting and am always happy when the full idea finally comes to me. Recently sold to a collector in TX. I came across these horses in a quiet, secluded pasture several years ago. I painted them into a scene from my imagination earlier this year. One of my paintings from the quiet and peaceful American heartland. I love the "patchwork" feel that the fields of the American Heartland seem to take on it mid summer here in the Midwest. 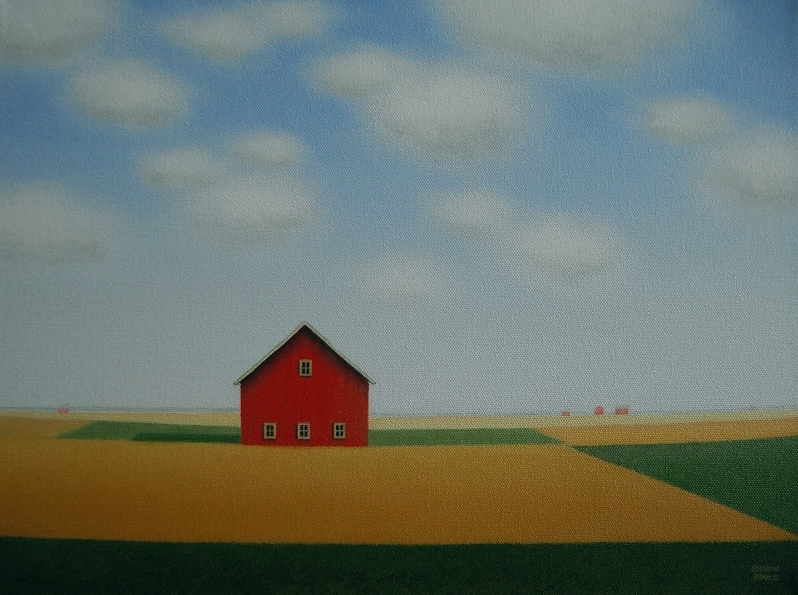 This painting is my impression of these fields with an iconic red barn setting in the midst of them. This piece has already been sold into a private collection. My original paintings can be purchased through the below gallery links. Sharon's current paintings that are for sale can be purchased through the following art gallery links below.